We are aware that with all our custom options available, picking a perfect combination can be daunting. 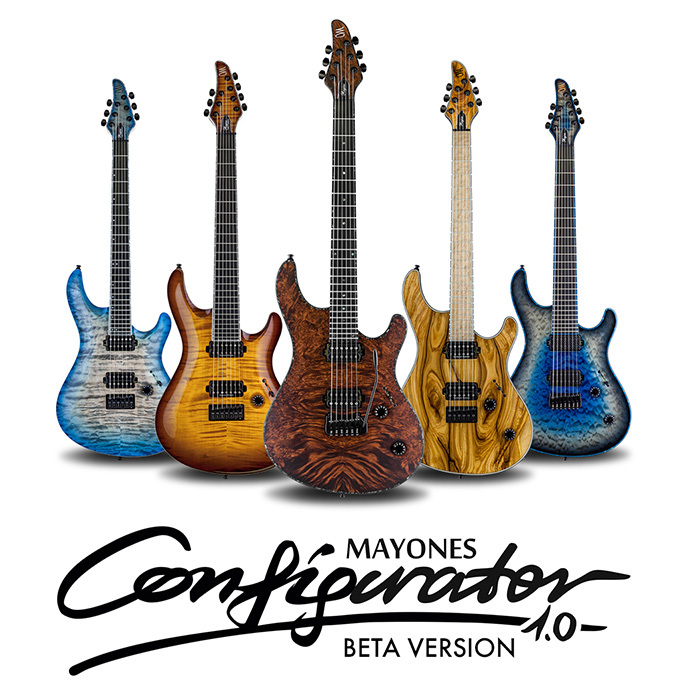 Therefore we created this tool to allow creating a preview of your dream guitar before you order it.We have made every effort to present you the most complete list of parts, colours & woods available at Mayones Custom Shop. However, if you still desire something extra, please contact your local Mayones Dealer. First of all, every piece of wood is different. Even within the same species and grades of timbres (for instance 5A Flamed Maple top) grain and texture vary from piece to piece. Additionally, a flat two-dimensional image fails to capture the inherent beauty of highly textured, deep 3D patterns of woods we use. Also, all colours & finishes vary depending on specific colour and texture of a particular piece of wood. Secondly, exotic & rare pieces of wood might simply be unavailable due to limited supply of particular species. Lastly, please note that computer screens differ vastly in colour, hue, and temperature representation based on their specification and even, if 100% calibrated, they are not perfect. While we put a tremendous amount of effort to give you a tool that is helpful and fun, please consider the end result as only a preview, not an exact representation of a completed guitar.